Nicole's Needlework: Quaker Garden - Finished! Now if the mail lady would be so kind to bring my Village of Hawk Run Hollow tomorrow that would be so nice! :) Speaking of stash... I went to Hobby Lobby today and found some great deals - I only spent $5! I got HSM 1805 by The Marking Samplar for $.51. 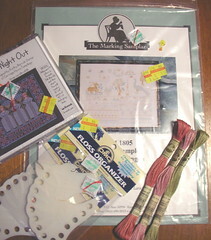 Next I got a Silk Mori kit from the Remember the Ladies series - Girls' Night Out by Kathy Barrick from Carriage House Samplings for $2.82. And last I bought some DMC thread holders for $.26 each and some DMC linen thread to do the freebie heart that Susan from A Stitcher's Finish Line stitched up (scroll down to 6/21 to see her wip). She used hand-dyed thread, which I thought was very pretty also!!! Dh went to Florida last night to do some things for the two police departments he applied with. He's going weigh the pros and cons of each deparment and decide from the two - assuming they both want to hire him! It looks like it's getting ready to storm here - I'll write more later! Edited to add a little better pic. It turned out wonderfully! Congrats on the finish and the great stash deals!! Congratulations on your finish! Just beautiful! Don't you just love to find stash for less? Makes it even better. It's beautiful Nicole - you did a fabulous job! How many hours (roughly) did you get to stitch each day you worked on it? Its beautiful. What a great stash shop you had and what bargains. Have a good weekend. Wow - that was fast! I plan to finish my Quaker Garden today, but it took me more than 10 days as it was my "stitch at work" project. Very nice job! Just beautiful! I just started this design and am stitching it with Karen and others. Looking forward to stitching this one! Sometimes I think I'm crazy!